Lorikeets are small members of the parrot family that grow 6 to 12 inches tall. 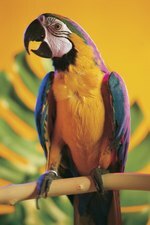 The colorful bird typically lives 7 to 9 years as a pet, although some can live as long as 20 years. While it's impossible to tell the exact age of your lorikeet without getting his birth date from the breeder, you can estimate his age during the first year of life. If your bird is already mature, your veterinarian may be able to provide an approximate age by examining her. Lorikeets hatch out of the egg with closed eyes and wisps of white down. Their eyes open at 14 days old and gray down covers their body by the 20th day of life. A chick who is nearly covered with juvenile feathers is approximately 40 days old. At 60 days, the chick has flight feathers and will begin trying her wings. Rainbow lorikeets begin developing adult coloration at this age as well although plumage is not as brilliant as their parents. Prevent parental aggression toward the now independent young by providing fledgling with their own cage. By 1 year old, the lorikeet has full adult plumage and her beak has changed from black to bright orange. Immature birds have pale eye rings, which turn to bright blue by 18 to 24 months of age when they are ready to breed. Once a lorikeet is fully mature, it's pretty much impossible to pin down their age, as they don't develop gray feathers or other external signs of aging. Older birds tend to vocalize less than young birds, have lower activity levels and sleep more. These symptoms are similar to those displayed by sick birds of any age, so its wise to have your bird checked by a veterinarian. Senior birds are also more likely to develop health issues such as cataracts, arthritis and organ failure.